Although he’s fighting a knee injury sustained during the off-season, Red Bull KTM’s Marvin Musquin is in the thick of the title chase, trailing points leader Ken Roczen by seven points through three rounds. 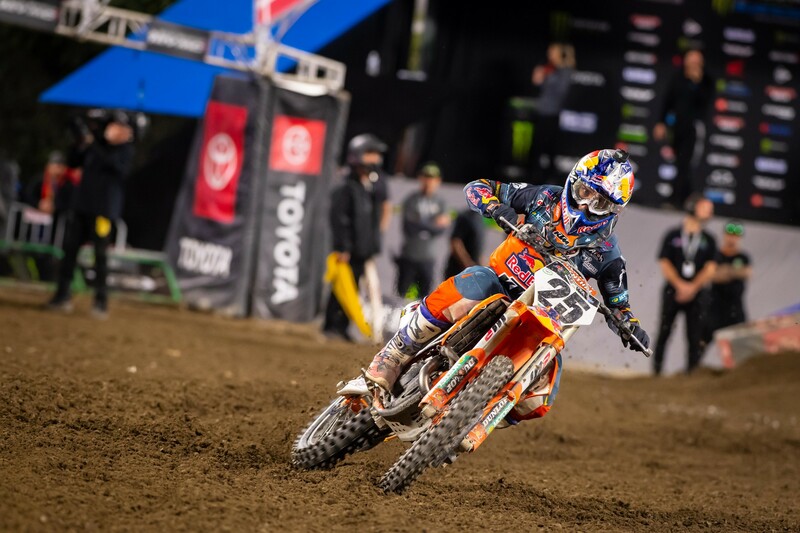 On Saturday night in Anaheim, Musquin rode great, putting together 3-2-2 finishes to claim second overall behind teammate Cooper Webb. He spoke with Steve Matthes after the race. Racer X: Nice work tonight. Where are you at physically right now? Marvin Musquin: It’s hard to answer. I’m just trying to build myself every week. Obviously this week I stayed in California and we had a lot of rain, but it kind of helped for the knee. Just a lot of leg days at the gym and a lot of cardio and it worked out fine. As long as I don’t have any pain, it will be good. It was definitely a great day, obviously. It’s awesome to get second place. It means a lot from where I come from, and just build from here. The track was really good. Good dirt, really technical. Like I said in the press conference, I think they’re trying to make the tracks really more technical and longer too. Try to get closer to the one-minute lap time and it’s awesome. Triple Crown format. What do you think now? You’ve done them for a couple years. What do you think? I think obviously when you do good, you like it. When your starts are good, you like it. I like it better all three the same 12 minutes. Last year the first one was a little bit too short maybe compared to the others. But all three same is okay. It’s hard. We’re so used to doing one main event, but like I said it’s fun when you do good. Eli had a good point: it’s three starts, it’s three first laps. Things that are dangerous for guys like you. It is a little bit sketchy. Yeah, we always mention that. It’s more risk obviously, three times. It’s hard to say. First time I’ve talked to you this year. How’s [David] Vuillemin? How’s that going? He’s awesome. It’s fun to work with him. We really focused on technique, lines, and stuff. He had good advice. I’m having fun working with him and looking forward to get better. Franky [Latham] and Aldon both told me they were scared of DV. He’s going to start yelling about things, he’s going to make everybody upset, because we know DV. But they both told me how great he’s been. Yeah, it’s awesome to see that. Obviously when you make changes like that, with the team and stuff, it’s not easy but we got it figured out and everybody is at his place and [letting him] do his job. DV is actually kind of smart. He’ll also tell you how smart he is. He will tell you what’s wrong, or the lines or the riding is not good, but he will also tell you when it’s good. That’s awesome. Jason Thomas and Daniel Blair join Steve Matthes to recap the first Triple Crown event of the year at Anaheim 2.